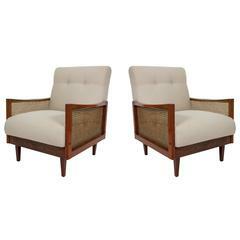 Two Modern Butterfly Rattan Armchair in Vintage Style. Made in France and inspired by the 50's and 60's, these generously sized armchairs feature wide can armrests and vintage green velvet. The seats and backs of each chair are upholstered in 100% velvet cotton fabric while the frame is made of hand waxed walnut with a natural, vintage patina. Dimensions: CM: 80 D x 61 W x 84 H Weight: 15 kg Ships within 4 to 6 weeks. A pair of 1950s armchairs, each crafted of Brazilian caviuna wood, including cushioned seat and tufted back, with caned sides. Excellent vintage condition, recently reupholstered. 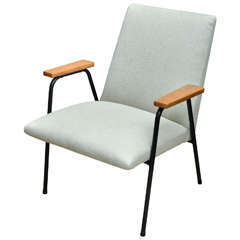 Black metal framed armchair with wooden armrests. Newly upholstered in natural colored linen with very pale blue thread integrated into weave. Small scaled chair. 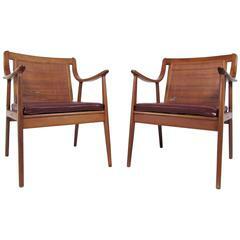 Beautiful pair of Italian, hand-caned chairs. Cushioned seat and back with yellowish-gold leather upholstery.